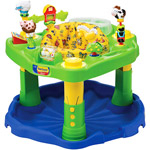 A safe alternative to walkers, our exersaucer is an activity center and learning center all in one. It provides a secure place for baby to rock, spin or bounce and promotes physical exercise to improve gross motor skills. For babies 4 mos. to walking. Colors and styles may vary.